Fitting in somewhere between the tech thriller Frequency and the Spanish horror masterwork The Orphanage, The Baby's Room indulges in an effective connection involving a haunted house and a technological abnormality that allows vision into an alternate universe. After an old baby monitor picks up some odd disturbance in the middle of the night that sounds like voices, Juan seeks a more advanced method of monitoring him and his wife Sonia's child during sleep. He comes home with the most advanced form of monitoring device with all the video surveillance bells and whistles, including infrared vision and a battery-operated screen. After they believe all their problems are solved, Juan spots something so frightening in the monitor that it sparks a downward spiral into insanity. 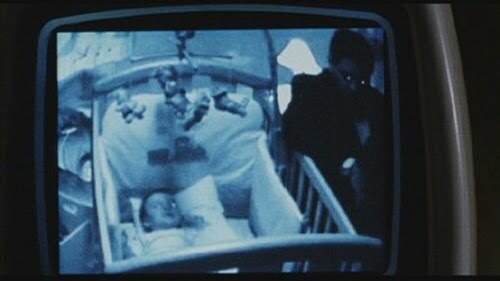 Perhaps the strongest flick of the Peliculas Para No Dormir series, The Baby's Room evokes a strong level of tension by peeking into the dangerous unknown by our modern technology. Along the way, it also tinkers with the properties of metaphysical reality and philosophical sciences. Somehow, Alexa de la Iglesia's film blends these two elements into an even stronger and oddly thoughtful pathway that leads straight into the unknown. Curiosity, insanity, and fear all come to a junction in its abyssal third act, one that'll really get your goosebumps going. Substantial performances and the fantastic architecture of this simple yet chilling ghost story barrel along to a whopper of a conclusion, one that'll really keep your head scratching once it makes sense -- well, at least as much sense as it can make.